RESIDENCY: 5 days/4 nights by yourself aboard the mighty sloop Intemperance. Intemperance is a fully equipped 38′ live-aboard yacht. There’s water, refrigeration, and a full galley. You can even plug in your laptop and keep your cell phone charged. 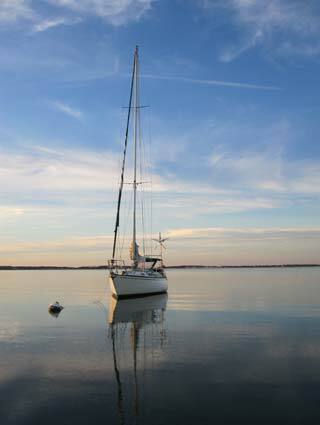 The boat will be moored in beautiful Lake Montauk, a well-protected all-weather anchorage. There is a dinghy for going to and from shore and world famous Ditch Plains beach is about a ten minute walk. GRANT: We are fundraising in order to offer a modest stipend. This stipend can be used to defray travel costs, the cost of taking time off work, or whatever else the SubGenius Grant recipient choses. The current total after 48 hours fundraising is $125, and we hope this will ultimately be $500-$750 by the time the fellowship is awarded. WHO: You. You’re a musician, a writer, a designer, a computer programer, a draughtsman, a scientist, a composer, an activist; pretty much anyone who could use a few days of uninterrupted quiet time to relax, recharge, and get some work done. HOW: You can apply for this fellowship by writing to my first name at this domain. Being the SubGenius that you are, I’m sure you can figure that out. Of course I want someone who will take full advantage of the opportunity, but I’m not going to tell you what to write because this is one of those “I’ll know it when I see it” kind of things. Samples and/or links to your work are encouraged. Please include references because I’m not going to let an irresponsible person stay on my boat, get drunk and drown. That would be a bummer. SCHEDULE: Applications must be made by May 31. We will acknowledge receipt of your application by email, and the Fellowship Selection Committee will announce its selection on July 4. REQUIREMENTS: You must be an adult, that means 18+. You must have dinner with me and my family on Wednesday Sept. 14. The purpose of the SubGenius Grant and Residency Fellowship is simple. In an increasingly hurried and distracted world, tranquility, time for reflection, and the opportunity for undistracted work have become ever more precious. We know that somewhere out there there is a person who just needs a few days peace and quiet to make something wonderful happen; to finish editing an article, or to lay the foundation for a beautiful piece of music. By offering the SubGenius Grant and Residency Fellowship we want to find that person, give them a few days respite from our over-accelerated world, and see what happens. Please share this, tweet this, blog this; but most of all send an application today! This entry was written by tony, posted on March 30, 2011 at 12:27 pm, filed under Uncategorized. Bookmark the permalink. Follow any comments here with the RSS feed for this post. Post a comment or leave a trackback: Trackback URL.